Whilst our goal is to answer all of your questions before you even have them, inevitably there are a few things that most of our guests still wonder about. If you don’t see your question answered here, feel free to reach out to us. Our Client Care team is standing by to make sure you’re in the know on all things regarding your tour. What is the Collette Chauffeur? In certain countries, hotel rooms tend to be smaller than the Australian standard accommodation. A double room is designed to accommodate two people, but may not have two separate beds. A twin-bedded room has two separate beds of any size, and is the type most commonly utilised. On many tours, triple and single rooms are limited and are available on a first come, first served basis. Be advised that single rooms are often smaller. We pride ourselves on bringing travellers the very best experiences a destination offers. Our itineraries include many activities and may consist of walking on uneven terrain or significant walking at times. Some of the most unique sightseeing can mean accessing locations that restrict coaches, especially in historic areas. Some hotels/lodges in remote locations may not have elevators. For your comfort, we recommend bringing walking shoes. Government-issued identification is required for all air travel. A valid passport is required for all trips outside of Australia. All passengers should check with the appropriate foreign consulate for entry and validity requirements. We recommend that your passport has six months validity, and at least 3 blank pages. Passports and visas are the responsibility of each client. The land price does not include international air travel to and from Australia, airline fees, airport or departure taxes, transfers, visas, customary end-of-trip gratuities for your Tour Manager, driver, local guides, hotel housekeepers, cruise ship waitstaff, and any incidental charges. So, whilst the cost of an optional activity may change from the time you book your tour, once payment is received in full, your preselected options are guaranteed by Collette at their original price. Although you can still purchase options whilst on tour, reserving them ahead of time ensures you a spot in the event that the activity sells out. Collette will provide a refund if you cancel a presold option prior to tour departure. Any presold options cancelled whilst on tour are nonrefundable. Whilst it is unlikely, Collette does reserve the right to cancel a tour prior to departure. Should this happen, Collette will make every effort to put you on another departure date. If an alternate cannot be found, a full refund will be made. Air booked through Collette will be protected. We cannot be held responsible for penalties incurred if you have secured your own air. Tour pacing varies by itinerary, and each destination's sightseeing and activities are unique. Pacing is subject to personal interpretation. 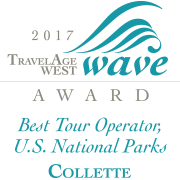 At Collette, we do include the best a destination has to offer, enhancing your overall tour experience. For overnight pacing of a tour, please refer to the "Accommodation" section on each tour page and on the tour map. These describe the number of nights you will stay in each hotel during your tour. The day-by-day descriptions will provide additional detail about the number of activities included in each day. The Tour Activity Level Ranking is featured on each tour itinerary in a circle. The definition of each activity level is listed here. If you have additional questions regarding a specific tour, please enquire at time of reservation. For your comfort, we recommend packing comfortable walking shoes so you can fully enjoy every aspect of your tour. Level 4: To truly experience the programme and destination, you need to be able to participate in physical activities such as longer walking tours, walking over uneven terrain, climbing stairs and periods of standing. Some of the touring days may be longer, with select included activities occurring later in the evening. Level 5: This tour is very active, requiring participants to be physically fit to fully enjoy all the experiences. This itinerary has more strenuous activities which may include such things as: extensive walking tours, transfers over uneven and dusty terrain, high altitudes, early morning departures, late night activities, or extreme temperatures. All conditions do not apply to all days, so please read the itinerary carefully and speak to one of our travel reservation agents to determine if this tour is right for you. We recommend this programme to individuals who are physically fit. Unfortunately, this tour is not appropriate for individuals who use either walkers or wheelchairs. If this trip is not ideally suited for you, our travel reservation agents can help determine the perfect trip for you. Roundtrip airport-to-hotel transfers are provided for all passengers who purchase airfare through Collette. These transfers do not apply to pre- and post-night stays. Passengers who do not purchase airfare through Collette can purchase transfers (for the first and last day of the tour) at an additional cost of $120 per person, roundtrip. Some restrictions may apply. All transfers leave at prescheduled times. It's your ticket to and from the airport. This service is available for all tour bookings. This personalised service is included in all Australian capital cities within a 40km radius from the international airport. *Service is available between 41 and 70 kilometres for a small fee. Not valid on group travel. It's our way of saying thank you for making us your #1 choice in guided travel. If you've travelled with us in the recent past and are not in the programme, you can sign up today!